These lab created emeralds are chemically identical to natural emeralds and match all the properties of natural emeralds. 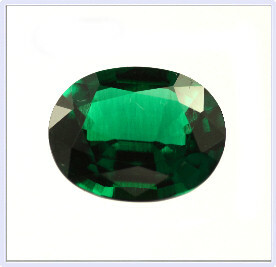 Although they are lab created, they are not flawless, but are much less flawed than natural emeralds. Nearly all natural emeralds are very flawed and need to be treated to improve their appearance and are treated with resin to fill in surface flaws which means they can be easily damaged and need special care when cleaning. These lab created emeralds are not treated at all and can be washed with soap and water. The lack of flaws makes them harder and tougher than all but the purest natural emeralds. These emeralds have been created with the hydrothermal method. Crystals are grown from a natural emerald in a solution under high pressure, this mimics the process of how emeralds form naturally. This green can vary in colour slightly from stone to stone and can be lighter and darker.